Faith formation is catechesis (teaching the faith) which aims deepen people’s contact with Jesus Christ through educational and enrichment opportunities. Designed to touch the heart as well as the mind, these programs help people live and experience a more Christ-centered life. The Church's mission is to provide effective ways of catechesis for people of all ages and backgrounds. And in doing so we create a connection to the new evangelization envisioned by Second Vatican Council, the work of recent Popes, and the Catechism of the Catholic Church, which open the door to on-going conversion and a deep sense of a faith. Ultimately, faith formation is oriented toward the question: How do I practically and authentically live the Catholic faith? At Risen Savior groups like the RCIA, Bible Study, adult faith formation meetings, children's faith formation, and F.I.R.E. 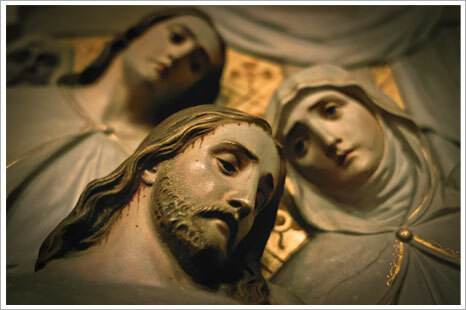 are the tools to help us better understand the heart and mind of Jesus Christ and His sacrament, the Catholic Church. And in so doing, we are better able to share with others, to evangelize, our understanding of our Catholic faith.